Pole Canyon, leading into the Boulders area from Secret Valley (where Ruby and Clover valleys merge at Secret Pass), has the unusual distinction of running north and south rather than the usual east-west direction of almost all the other canyons. The Boulders area in the East Humboldts refers to 1st, 2nd, 3rd and 4th Boulder Creek canyons and their primary destinations Boulder Lake and Humboldt Peak. Birdeye Lake is usually not on the top of anyone's list but it can be a secondary destination. Steele Lake can be viewed or even accessed by climbing the ridge behind Boulder Lake. Boulder Lake and Birdeye Lake can be a one day pack trip. An overnight trip is recommended for extending the destinations to Steele Lake or exploring Humboldt Peak. After climbing to the ridge separating Boulder and Steele lakes, Humboldt Peak is a short distance away with only a moderate additional gain in elevation. Humboldt Peak is the second highest peak in the East Humboldts range at 11,020 feet (Hole in the Mountain Peak is the highest at 11,306 feet). These elevation figures are from USGS sources. The full Pole Canyon route distance is around nine miles but three miles of riding can be eliminated by driving the first three miles up a serious 4-WD road. The vehicle should have higher than normal clearance and very good tires. This is not the place to shred a tire. It takes about the same length of time to drive these three miles as it would by horse. You must decide a few days ahead of time whether to drive the first three miles or ride the entire nine miles. A horse trailer cannot be towed up this road and if you elect to drive the three miles, Walt Gardner will lead the horses in a day ahead of time, spend the night, and then drive down the following morning to the meet location. It is recommended that the meeting time be as early after daybreak as possible. The meeting place will be at the junction of the Secret Pass road (SR 229 off I-80) and the North Ruby Valley road (on the other side of Secret Pass), a good 45 minute drive from Elko. To arrive at the meet location, take I-80 east out of Elko for about 15 miles to the junction of SR 229. The exit sign will indicate Halleck and Ruby Valley. A few miles ahead the paved road will cross the low point in the mountain range (Secret Pass) and will wind down towards the Ruby Valley road. The junction to the North Ruby Valley road will be on the left just a short distance from the end of the pass. If you come to Hidden Lake Outfitters on the left, you have gone too far. The continuation of SR 229 south through Ruby Valley will eventually pass by the junction to Harrison Pass, the Ruby Lake National Wildlife Refuge Headquarters, Cave Creek, the Gallagher Fish Hatchery, Shantytown and the Ruby Marshes. The entrance to Pole Canyon is just a short distance farther up the North Ruby Valley road from SR 229. By driving the first three miles up the canyon, the horses will be waiting in a grove of aspens and cottonwoods. The moderate and easy to follow trail continues up Pole Canyon and passes interesting rock formations along the way. This is a likely area to spot deer, bighorn sheep and mountain goats. At the head of Pole Canyon the trail will drop down and cross 1st Boulder Creek Canyon. There is a large pond at the head of 1st Boulder Canyon that is actually large enough to qualify for lake status. The trail and riding conditions across 1st Boulder Canyon are still mild but things change drastically as the trail descends into 2nd Boulder Creek Canyon and up the far side to the ridge overlooking 3rd Boulder Canyon. This section is rather long and steep and everyone agrees that more switchbacks should have been included when the trail was constructed. On the positive side, however, the trail lacks the numerous rocks that are prevalent along many other trails. If, after arriving at the ridge above 3rd Boulder Canyon, your destination is Boulder Lake or Humboldt Peak, the trail will continue down Suicide Pass into 3rd Boulder. If the destination is Birdeye Lake via the ridge, the ridge will be the stopping point. 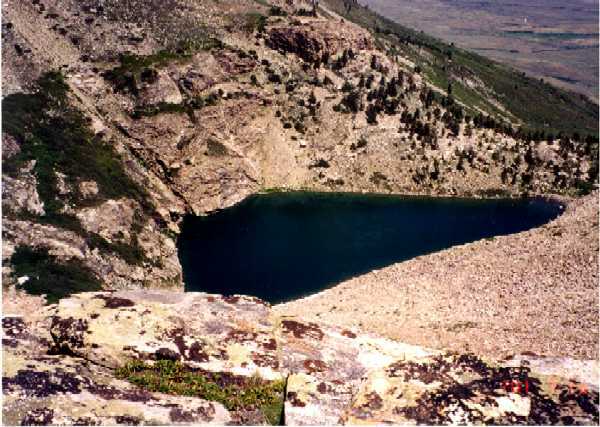 Note that Birdeye Lake can be accessed from 3rd Boulder Canyon by a steep climb and fighting the usual brush. This would be the way to proceed if going to Boulder Lake via 3rd Boulder Canyon from Starr Valley. From the stopping point at the ridge above 3rd Boulder Canyon, it is a difficult scramble up, over and around large boulders and dense shrubbery towards Birdeye Lake. This is all uphill. A topo map shows the distance as about 3/4 of a mile but fortunately it is less than a half mile. After climbing a short ways, Boulder Lake can be seen in the distance by looking down and backwards to the right. Eventually Birdeye Lake will be seen below the ridge on the 3rd Boulder side. While very few even view Boulder or Steele lakes, fewer yet ever see Birdeye Lake. Don't look down, hang on to the wall and watch your footing. Some distance up the ridge the most direct route is across a 30 foot section where there is less than two feet separating the wall from the vertical edge of 3rd Boulder Canyon. On the way back down I bypassed this section by taking a longer and more difficult route, reasoning that the possibility of falling from a loose boulder would be preferable to the other possible alternative. Trekking poles, unless equipped with rubber tips, were not intended for rocks but they did provide enough stability to limit this detour to only one fall. But to do it again, I would take the original route back along the edge of the canyon. During the climb up the ridge, be extremely careful over the rocks to avoid any ankle injury. And most of all, the dropoff from the ridge into 3rd Boulder is very sheer so don't unnecessarily venture too close to the edge. After bouncing over boulders, there is hardly any stopping until hitting the bottom of 3rd Boulder Canyon. 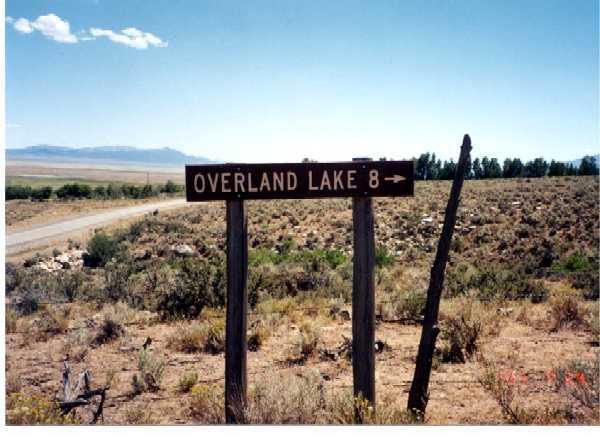 The Overland Lake trailhead at Ruby Valley can be reached from Elko by driving to Spring Creek on the Lamoille Highway (SR227) and turning right at the traffic light onto SR228 towards the entrance to Harrison Pass (33 miles). Descending into Ruby Valley 11 miles later, make a left turn onto the Ruby Valley road and nine miles later watch for the Rock House a short distance off the road on the left. About three quarters of a mile past the Rock House, cross a cattle guard and the Overland Lake trailhead sign will be visible on a fencepost, again off to the left. The trail access road extends into the foothills about a quarter mile; travel up the road as far as your vehicle can make it. The trailhead sign says eight miles; Michael White in his excellent book says five miles; but most are satisfied at calling it around six. It may come as somewhat of a surprise that the trail to Overland Lake does not proceed up Overland Creek Canyon that drains the lake. The trail, hot, dry, dusty and through sagebrush at the start, traverses three canyons, gaining altitude with each canyon with the aid of numerous switchbacks. There is no shade and, unless you come across a rare seasonal spring, no water along the way. Scenery improves somewhat upon reaching the second of the three canyons. Overland Creek Canyon is a considerable distance off to the right (north) and you never actually drop down into the canyon. You are about at the lake when the Overland Lake trail merges with the Ruby Crest trail. Less than a quarter mile from Overland Lake, the trail merges with the Ruby Crest Trail that runs between Lamoille Canyon and Harrison Pass, a distance of about 42 miles. Taking the left fork where the Overland Lake trail merges with the Ruby Crest trail, Overland Lake is less than a quarter mile farther up the trail. You�ll know you are about there by the presence of a cabin constructed by the CCC�s that is adjacent to the trail and just a few feet from the lake. While people do stay in this cabin, it is not recommended due to viral content from various rodents that also call the cabin home. Additional Overland Lake photos and information can be found at Part 2, Other Wilderness Areas and Part 3, Outfitters, Pack Trips and Backpacking Guide Service. The Ruby Crest Trail is not along the spine or crest of the mountains as might be suggested by the name. Even if a definite crest could be defined, it would be impossible to follow because of the knife edge ridges. Instead, it is switchbacks up one hard canyon and down another, and then repeat over and over again. At best, the trail traverses the crest from one side to the other on just a very few occasions. Between the Wines Peak area and Overland Lake, the trail extends primarily along the east (Ruby Valley) side of the range. A short distance past Overland Lake and on in to Harrison Pass, the trail extends along the west side of the range. An abbreviated Ruby Crest Trail hike can be made by hiking from Lamoille Canyon to Overland Lake and then down to the Overland Lake trailhead in Ruby Valley rather than continuing past Overland Lake to Harrison Pass. This will reduce the distance from about 42 miles (all the way to the Harrison Pass road) down to about 30 miles. The above sign photos partially suggest how this is done. Start on the Ruby Crest trail at the end of Lamoille Canyon, passing the obvious landmarks over the first seven or eight miles that include Lamoille Lake, Liberty Pass, Liberty Lake, Favre Lake, N. Furlong Lake and Wines Peak. Take a side jaunt down to N. Furlong Lake and back if desired since the lake is not on the main trail. This is usually the last chance for water until reaching the Overland Creek basin that is still some distance ahead in double figure miles. One suggestion on water is to completely replinish from Kleckner Creek when passing Favre Lake and then consider if this supply will be sufficient until reaching the next convenient water source at the Overland Creek basin. It is less than two miles from Favre Lake to the junction of the North Furlong Lake trail, with only some moderate steepness up a series of switchbacks up to that point, and a side detour down to North Furlong just for water may not be appealing or even necessary. However, there are reports of a spring a short distance down the North Furlong Lake trail. The spring is shown on some topo maps and appears to be just a short distance down the N. Furlong Lake trail from the junction of the main trail and on the left (south) side of the N. Furlong Lake trail. To locate springs, look for narrow swaths of green vegitation, usually dwarf willow bushes, extending down the mountain side. This is frequently an indication of the presence of water underneath that should eventually surface. After reaching the Overland Creek basin, which extends about three hiking miles across, water will, or should, be available from several branches of Overland Creek before the trail actually reaches Overland Lake. Springs or small creeks fed primarily by snow runoff can be seasonal. Early season water that is available during July and August may not be available during September or October. The above photos are intended to show the vastness of the Overland Creek basin but were not taken explicitely for that purpose so they are somewhat lacking. Much of the basin still extends to the left of the photos and out of view. Estimating distances accurately from Wines Peak to Overland Lake is somewhat iffy. Accepting the 18 miles to Favre Lake as shown on the sign nailed to the tree (see above photo) as being accurate enough, then adding another five miles from Road�s End to Favre Lake, the distance to Overland Lake would be in the vicinity of 23 miles. That means it is about another 15 miles from Wines Peak to Overland Lake but water is usually available from the branches of Overland Creek some distance before reaching the lake. It is generally agreed that there are about 12 miles without water from the Wines Peak area. The above two photos are from the south approach to Overland Lake and provide distant views of the approach from the north across Overland Creek basin. Much of the basin still lies to the left beyond the lake and out of the photos. Overland Creek Canyon is easily identified as it makes its way down towards the Ruby Valley road. The Overland Lake trail from Ruby Valley does not follow the canyon. From the Overland Creek crossings, the next significant landmarks are the two signs shown in the photos in the above section (that are just a few steps from each other). It is then less than a quarter mile to Overland Lake. At that point, continue to the lake by taking the right fork at the trail junction near the Ruby Crest Trail sign until reaching the cabin that is adjacent to the lake. Then backtrack to the trail junction, which will again be the right fork on the return trip, and follow the trail down to the Overland Lake trailhead at the Ruby Valley road. This will put the total distance at around 30 miles. Unless you happen to come across a seasonal spring, there is no close by water all the way down to the Ruby Valley road. But the good news is that it is all downhill; hot, dry and dusty perhaps, and with no shade or water and little scenery, but all downhill. And, of course, you should have a vehicle spotted at the Ruby Valley road or have someone there to pick you up. However, it probably wouldn't be at all difficult to hitchhike your way into Elko via Harrison Pass. Traffic is sparse but you would probably get a ride from the first passing vehicle. The first leg might only be to Harrison Pass, but the first vehicle going over the pass would probably be your second ride. Most drivers heading over the pass would be going all the way to Elko or at least to Spring Creek. Almost all drivers along the Ruby Valley road and to some extent when going over Harrison Pass will wave at each other when passing in opposite directions. This is an area where you will get emergency road service from the first passing vehicle. Cell phones in the mountains and even in Ruby Valley are for the most part useless. A few reports indicate cell phone success from some mountain areas, but, just for conducting some experiments, I have never been able to make cell phone contact from any areas in the mountains that I have tried. From what single vantage point can you see four different lakes? Well, actually you can see three in one view but by turning around and looking the other direction you can see the fourth. If your answer is Lake Peak, that is correct. The three lakes in the same view are Liberty, Favre and Castle and by looking the opposite direction you can see North Furlong. Like a typical trip to Liberty, Favre and Castle lakes, the trip to Lake Peak starts out on the Ruby Crest trail from the end of Lamoille Canyon, passing by Lamoille Lake and continuing over Liberty Pass. Lake Peak is the highest peak in back of Castle Lake at almost 11,000 feet in elevation (USGS gives the elevation as 10,922 feet) and can first be seen when coming over Liberty Pass. The peak is obvious in the above photo. The gentle sloping mountain in the background at the center of the photo is Wines Peak at 10,893 feet. The best camping site at Favre Lake is on the small ledge, near top center of above right photo, right where the trail crosses Kleckner Creek below the lake. There appears to be one or two tents at that site in the above photo. Lake Peak can be accessed by a steep, hard climb from the Castle Lake side, but the recommended route to the peak is to continue following the Ruby Crest trail past Favre Lake for two additional miles of moderate hiking. With the help of switchbacks along the trail, there is one low but steep ridge to cross. After crossing this ridge to the North Furlong Lake basin, the terrain levels out to a nice panoramic view with North Furlong Lake down to the right, Wines Peak up ahead, and the Lake Peak ridge out of view but up and to the left. A ways farther down the main trail, a trail branching off to the right will lead to North Furlong Lake. The main trail then passes through the few remaining trees in the area and empties into a barren, treeless, almost shrubless plateau. The trail will then bend to the right towards Wines Peak. If your destination is Lake Peak, leave the trail and make your way towards the Lake Peak ridge on the left. However, you won't want to miss the sheer dropoff on the far side of the plateau. So instead of immediately veering to the left, keep walking straight until reaching the edge of the plateau but don't go any farther. Ruby Valley can be seen on the other side and this is usually a good Mountain Goat and Bighorn Sheep spotting area. After taking in the view, start the climb to the peak on the left by staying close to the left side of the ridge. The terrain steepens and the climbing becomes difficult because of rocks and typical loose footing. There is a four foot high rock monument at the peak but this cannot be seen until you are almost right on top of it. Chances are you will first hit the ridge some distance on one side or the other and will then have to scramble uphill in the appropriate direction to find the monument. A jar containing a small tablet and pencil is hidden in the monument. Move a few rocks to find it and you can sign yourself in to immortality. From this point you can view Liberty, Favre and Castle lakes in one direction and North Furlong Lake in the opposite direction. With an appropriately early start, this hike can be made in one day but it would also make an ideal three day, two night outing. On the first day hike in to Castle Lake or Favre Lake and spend the night. When looking for a campsite, Castle Lake may be the better choice, but there is also a good one at Favre Lake, if not already occupied, close to where the trail crosses Kleckner Creek (draining Favre Lake). The next day continue around to Lake Peak but also take in North Furlong Lake and Wines Peak. Return to your camp for the second night and hike out the next day. However, if you don't care for all that hiking, contact Bill Gibson of Elko Guide Service, tel 775-744-2277, and arrange for a single day or overnight horse trip into the area. Smith Lake is close to Angel Lake which is located at the extreme north end of the East Humboldt section of the range, and is the only lake in the entire range you can drive to. Drive to Wells, 50 miles east of Elko, and then take the 12 mile drive up to Angel Lake. Angel Lake has Brook, Rainbow and Tiger trout. Part 2 of this site describes the hard and masochistic way of going into Smith Lake from the Greys Lake trail starting from Angel Lake. Since Smith Lake is only a mile or so away from Angel Lake, there just had to be an easy way in and there is. Start on the Greys Lake trail from the parking area at Angel Lake (the same start as described in Part 2) and the trail crosses a fence about 200 yards up the trail. However, after crossing the fence, instead of continuing straight ahead on the Greys Lake trail as described in Part 2, another trail follows the fence line up to the left. Lake's location in the right photo is just below the "V" in the skyline. Take this trail to the left. It is a little steep to begin with but it is hardly more than 150 yards to the corner of the fence where the terrain starts to become more gradual. The fence line makes a 90 degree turn to the left (upper left photo) and the trail continues straight ahead and meanders up the gentle slope through the shrubbery to a low ridge. At that point the lake location can be clearly identified by the close-by cliffs surrounding the lake. Up to this point the route has all been out in the open and not exactly scenic. Shortly beyond the ridge the trail will start to pass through a few trees and there will be about 200 to 300 yards of trail that sidehills the steep, upper part of the basin above the small canyon off to the right. This is the same canyon that was so difficult to climb off-trail from the earlier Greys Lake trail route. Due to the dense tree coverage around the lake, you are almost on top of it before you can actually see it. The trail will cross a small creek draining the lake and a few yards later you have arrived. Hiking time can hardly be more than an hour, if that. Smith Lake is a very scenic lake and it now gets my vote as the most scenic lake and basin in both the East Humboldts and the Rubies. Fishing, however, could be somewhat difficult due to all the rocks and dwarf willow bushes that surrounds almost the entire shoreline. A July 2004 fishing report was not very impressive--four trout (not identified but probably Cutthroats) between seven and eleven inches were caught in an hour. But that can be typical for Cutthroats while fishing for Brooks is usually much more productive. As close as it is to Angel Lake and so easy to get to, Smith Lake still does not seem to be widely known. This has to be mostly due to lack of signs or other advertisement. The Greys Lake trail sign at Angel Lake, where the hike begins, only mentions Greys Lake and not Smith Lake. Greys Lake is a terrific Cutthroat fishing lake but not many hikers go to Greys Lake from Angel Lake due to the distance and difficulty. During the first week of September 2004, Dan Domina, former Reno resident now at Oregon City, Oregon, made the trip to Smith Lake, and camped over several nights. The weather was not the most pleasant, getting snow one night and high winds much of the time that flattened the tent on a few occasions. The fierce winds even prevented climbing to some of the ridge lines. Fresh cougar tracks by the lake, a howling pack of coyotes near the camp, and close encounters with bighorn sheep (good photos below) more than made up for the bad weather. Snowcocks, however, failed to cooperate and remained hidden. Fishing, catch and release, for cutthroats was good but they were on the small side. During the time Dan was there, only two parties of day hikers arrived at the lake. It remains unbelievable that such an easy hike only a mile or so from Angel Lake is relatively unknown. Female ewes can be identified by their smaller horns that never exceed a half curl. Mature rams around seven or eight years of age with their more massive horns can have a full curl. The center photo shows the very rocky terrain around the lake. By climbing to the ridge to the left of Smith lake through this rock pile, Angel Lake can be viewed on the other side. Clover Valley that has been referred to several times throughout these pages provides access to Hole in the Mountain on the east side via Lizzie's Basin. Drive to Wells on I-80 and exit on Highway 93 south towards Ely. Traveling from Elko, the exit is about one mile past SR 231 that leads to Angel Lake. Five miles later on Highway 93 watch for the Clover Valley sign (SR 232) and make a right turn onto the paved road that will proceed along the base of the East Humboldt mountains. Six miles later look for the Week's Creek Canyon turnoff sign on the right. This is a public access road that will lead to Lizzie's Basin and farther into the mountain. Hole in the Mountain can easily be seen from here and if this is your destination, continue as far up the road as your vehicle will take you. A 4-WD is necessary once you get some distance up this road. Hole in the Mountain (the window, also called Lizzie's Window) can be seen just to right of center in the above photo. Hole in the Mountain Peak, the highest peak in the East Humboldts at 11,306 feet, is not the same peak that contains the window but is some distance north (to the right) and can be seen about mid distance between the window and the right edge of the photo. Elevation for the window is given as 11,127 feet. Steele Lake is located on the Clover Valley side of the East Humboldt range (Boulder Lake is just over the ridge on the Starr Valley side) and Steele Lake can best be reached from Clover Valley. Humboldt Outfitters (Wildy Brough) is located right below the lake on the right side of the Clover Valley road about one mile passed the Weeks Creek Canyon turnoff. A trail goes part way up the mountain to Steele Lake and if you might be interested in making this jaunt, give Humboldt Outfitters a call in advance at 775-752-3714 for whatever arrangements you would like to make. The old way to Steele was to bushwhack all the way up the mountain through rocks and sagebrush. The trail part way up would now make it much easier, or you could ask about a horse trip to the end of the trail and then hike in the rest of the way. Steele Lake is one of the best fishing lakes for Brooks and is a likely area for spotting Mountain Goats and Bighorn Sheep. Boulder Lake can be reached by making the steep and difficult climb from Steele Lake to the ridge and then descending to Boulder. Mountain goats have no trouble with this route. There is at least one reference to accessing Boulder Lake via Weeks Creek Canyon but I am not aware of anyone who has actually done it. And I don't know if this route would be any less difficult than from Steele Lake since the ridge would still have to be climbed, but in a different location, before descending to Boulder. The Week's Creek Canyon route would be slightly longer, bushwhacking would be the trail of the day, and with a partial trail to Steele, the best bet would probably be to make the trek to Steele and then climb over the ridge from there and descend to Boulder (if Boulder Lake is still high on the agenda). Week's Creek Canyon is reached via the turnoff mentioned above leading to Lizzie's Basin and towards Hole in the Mountain. At the turnoff from the Clover Valley road, Hole in the Mountain Basin is ahead and slightly off to the right. Week's Creek Canyon is the next canyon to the left (south), and Steele Creek Canyon is the next canyon to the south after Week's Canyon. If attempting Boulder Lake from Week's Canyon, this access road will at least lead right up to the base of the mountain and eliminate the need for any preliminary hiking. Additional information on Boulder and Steele lakes, accessed from Starr Valley, can be found at Part 2, Other Wilderness Areas. If you are traveling along the Ruby Valley road south of the Harrison Pass junction, take the time to stop at the Ruby Lake National Wildlife Refuge and from there take a short hike to nearby Cave Creek. A creek actually comes out of a granite hole at the base of the mountain. 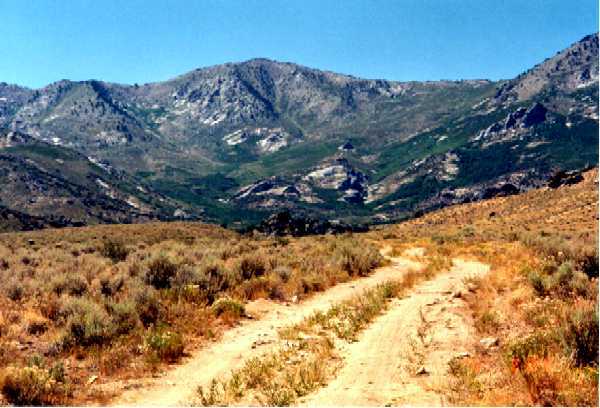 The trail in, a mild hike of less than one quarter mile, is located just off the Ruby Valley road about 100 yards south of the Wildlife Refuge headquarters. Park at the Wildlife Refuge parking lot and then walk down the road to find the trail. As the story goes, around 1867 soldiers from nearby Fort Ruby found the cave and decided to do some exploring by taking a boat inside. The entrance to the cave is quite small so they had to construct the boat in pieces small enough to take the individual pieces through the opening, and then assemble the boat on the other side. One source has it that the boat capsized and sank and all but one of the soldiers drowned (not likely since the water depth is not that great). Another version says that the explorers came to a dead end wall some distance into the cave but it was apparent that the creek continued on the other side of this wall through an opening below the surface of the water. One soldier then submerged beneath the water and went under the wall but eventually suffocated on the other side (there appears to be some variation of truth in this). The remaining soldiers then made it back out alive. Attempts to obtain good photos of the cave opening were somewhat less than safisfactory. The above images actually show the creek, which you can walk or crawl right up to at the cave opening, but the water does not display well in the photos. The small cave entrance definitely prohibits any large objects from being taken inside, but assembling small pieces into a boat capable of carrying several soldiers seems absurd. But if a boat was assembled in that fashion, you would probably expect it to come apart and sink. The following paragraphs are condensed versions of six reports and articles that were furnished by the National Wildlife Refuge in Ruby Valley that relate to Cave Creek cave explorations. 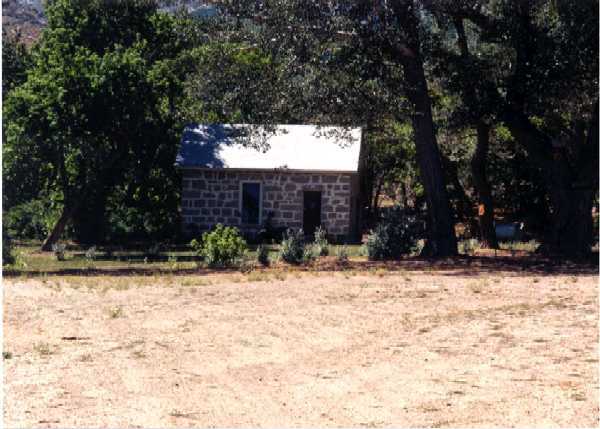 The Wildlife Refuge office is located less than a quarter mile from the cave. These explorations are not complete without bringing in the legend of the ghost soldier who is to have lost his life while exploring the cave. While it appears that one soldier from nearby Fort Ruby did in fact lose his life in the cave in 1865, any reports to verify the circumstances and to positively identify the soldier appear to be non-existent. All comments in parenthesis were added by the website author in an attempt to clarify related statements. Discovered in 1862 by Charles Stebbins, this article makes reference to the Ruby Mountain "Caverns" as taken from the History of Nevada, Thompson & West, Oakland, CA 1881, and states that caves located in the Ruby Range in Elko County Nevada were held in superstitious fear by the local indians. The article goes on to say that the entrance to this subterranean lake (actually not a lake) is through a natural tunnel about six feet long that is large enough to admit only one person at a time which then leads to a beautiful sheet of water 100 feet long by 50 feet wide. At its further extremity is a rock partition that comes down within two feet of the water's surface and beyond this partition lies another smaller lake (again not a lake). The cave had been explored until an abrupt turn was reached, when the explorers fearing to proceed further returned and left the mysteries of what lay beyond a secret. The sheet of water hides from the visitor the remains of one who lost his life in 1865 while seeking to learn these hidden mysteries. On 6/16/1887, John T. Baker from Eureka, NV, informs the editor of the Eureka Sentinel of a talk that he had with a soldier who has been dead many years, and he assures the editor that what he is about to relate actually happened. Baker related the legend that soldiers from Fort Ruby heard about the cave and were determined to explore it. They constructed a small boat in sections and put it together on the other side of the cave opening since the entrance was so small that only one man could enter at a time. After assembling the boat, and with some whiskey along, the navigators made their way 500 yards (closer to 200 feet) into the cave until encountering a perpendicular rock partition that stopped further progress. Water, however, boiled out from under this partition. Upon tapping the rock which sounded hollow, they concluded that the cave continued beyond the thin wall. One of the men, more daring, reckless or more inebriated than the others proposed that he would plunge beneath the water to gain access to the other side of the wall. This he attempted but after some five minutes the water brought him back up a corpse. Baker then relates that one day in January, using candles and matches for lumination, he explored the cave on his own. Squeezing through the small entrance he used a small boat that he knew was already in the cave and poled upstream until he came to the place where the water emerged from the other side of the granite wall. Gazing at the spot where the soldier made his fatal plunge, a soldier dressed in regulation uniform stood up before him and they had a brief conversation. The soldier told Baker to get out of the cave which Baker abruptly did. Baker returned to the cave some time later, saw the same ghost soldier, and had a long talk with him. This time the soldier told him that he had not drowned, but instead suffocated after reaching the other side because of the lack of air. (This might have been possible since the passage to the inner chamber was beneath the surface of the water which may have cut off any air supply to the inner chamber.) Baker states that he will give the soldier's story in another letter. Baker then relates his second visit to the cave which he calls a more pleasant experience. This time the ghost soldier told him that he has power of speech which is very rare among the spirits. The spirit went on to explain that a lady in the valley became the loving object of his affections. His commanding officer, Colonel Jerry (Jeremiah) Moore, was also an aspirant for the lady's affections and accordingly, would not grant enough leave for the soldier to see or speak to her and he could not even communicate by letter. A report got back to her that he had either deserted or was killed by the indians. Upon hearing this she was frantic with grief to such an extent that her parents sold their ranch and went east, leaving no clue as to where they went. This information was reported back to the soldier by a scout after the family had left. The spirit soldier then stated he was so wild and crazed that he cared not whether he lived or died, and that he came to the cave with some of his comrades for the express purpose of ending his existence, having his companions think it was an accident. He then drank some liquor to brace himself and then made the plunge (to go under the wall), knowing that he would not come back alive. The spirit related that he is doomed to stay in this lonely cavern for ages yet to come as a punishment for his self-destruction, but that some time in the future he will be released from this restraint. The Nevada State Park Commission asked author S.M. Wheeler, accompanied by H.B. Harris and J.J. Gregory, to explore and report on the Cave Creek cave. Wheeler refers to the earlier History of Nevada version of the cave exploration by Thompson & West as highly imaginative and any references to "lakes" in the cave are merely wide spots in the channel and there are no stalactites worthy of mention. The names Tom Short and A.G. Dawley again appear and are identified as former cave explorers. Wheeler's cave explorers, upon arriving at the location, were able to use a ten foot metal boat, already in the cave, loaned to them by ranger H.H. Dill of the Wildlife Service. Using carbide lamps for illumination, the party descended through the narrow opening into the cave. Continuing upstream they encountered two sandy shelves and came upon a room about 70 feet long and 75 feet wide. They failed to see anything that could be called a "Great Organ" (another source had reported a rock formation that resembled a Great Organ). Wearing full and partial wet suits and using inflatable two and three man life boats, team leader Sam Baker, Glen Roberts, Dennis Hone and Bob Swain made their first exploration into the cave on 3/23/1981. They passed the sandbars as described by Wheeler in his 1939 exploration and upon arriving at the "arch" location, discovered that the arch was now 14 inches under water, preventing further progress upstream. They continued with an examination of the outer chamber and did a Brunton-Tape and compass survey along with a general sketch. Their report mentions the "idol" on the NW wall (above the arch) and some short heavy ribboning extending from the ceiling in a few places (one of these could be the "Great Organ" referred to in another source). Dripping water is described as infrequent and sparse. An artifact in the form of a rusted can is partially buried in the silt bar in the C.J. room (C.J., meaning "Chinks Jinx", is the name dubbed by the explorers to the room with the Chinese god since it was here that one of the rubber boats met its demise after bursting a seam). The dimensions of the C.J. room are indicated as 65 feet by 95 feet and with a maximum ceiling height of 28 feet. Water and air temperatures are 43 degrees F. The presence of considerable fog complicated flash photography. With one boat out of commission, Captain Sam Baker ferried each explorer individually out of the cave. Since it was Sam's boat that initially sunk due to the rupture, the other explorers protested his ferrying action, saying that a really good Captain should have gone down with his boat and then added: "Just our luck; the rest of the world gets Captain Jacque Costeau and the "Calypso", and we get Captain Queeg and the "collapse-so". The accompanying diagram prepared of the outer chamber indicates a water depth of about five to nine feet. A "chimney", not further described (perhaps a hole in the top of the ceiling), in the C.J. room is indicated as "24 feet from water floor". The explorers then plan their next exploration by lowering the water level in the cave in order to gain access to the inner chamber through the arch. To make the second exploration, the same team members again led by Sam Baker obtained permission from Wildlife Refuge personnel to lower the water level in the cave in order to make entrance into the inner chamber. This was accomplished by manipulating a wooden "weir" that is used for controlling flow of water. They were hoping for a two foot drop in the water level. On April 26, 1981 they entered the cave using inflatable boats and a flotation tube. Upon reaching the C.J. room the underwater siphon between the inner and outer chambers had been eliminated and there was now a clearance of five to seven inches between the water and the center of the arch. The water was now about 28 to 30 inches deep at this point. They referred to this section as the "duckunder". They could now force the partially inflated rubber boats through the "duckunder" and into the next passage. The curse of the C.J. held true as one of the members lost his glasses going under the ledge but they were eventually recovered. The inner chamber widened to several feet and the ceiling tapered to a narrow "A" frame and appeared to be over 50 feet in height. They followed the passage into the cave as it made a 90 degree turn to the left followed by a turn to the right up to the last room with another high pinched-in ceiling. Neither water flow nor air flow could be detected and the water source remained hidden. They theorized that there could be additional hidden siphons and watertraps up ahead that could block air flow. The resulting diagram from the second expedition shows their total passage length to the end of the inner chamber as 531 feet and the perpendicular straight line distance from the cave entrance to the end of the inner chamber as about 435 feet. The diagram does not indicate water any deeper than seven feet and none of the water filled rooms deserve lake status. Part 3 Supplement Outfitters, Pack Trips, Thomas Canyon, Right Fork Canyon and Ruby Valley provides additional information and photos for Ruby Valley and the Ruby Marshes which are popular for bass fishing. The commute for bass fishing at the marshes is about 60 miles from Elko over Harrison Pass and about 75 miles from Wells. For overnight stays, the South Ruby Campground located just off the Ruby Valley road is a short distance beyond the Ruby Lake National Wildlife Refuge office. Boat launching areas are available at two locations near the campground. The fee is $12 per night and reservations can be made through reservation number 1-877-444-6777. Some of the distances from Elko to the various destinations, especially to the Lamoille Canyon area, are relatively short and can be made without much concern for running out of gasoline. However, start out with a full tank from either Elko or Wells if driving the full distance of the East Humboldts and Ruby Mountains along Clover Valley and Ruby Valley. The Clover Valley, Ruby Valley road does not quite extend the full distance along the base of the mountains as might be expected, so consult a highway map before making this drive or carefully follow these directions: Starting from Wells, proceed south 5 miles on US 93 to SR 232, the junction to Clover Valley. Follow SR 232 for about 16 miles through Clover Valley along the base of the East Humboldts which then turns back onto US 93. Six miles later on US 93 take SR 229 towards the mountains which will intersect with the North Ruby Valley road seven miles later. Cross this road and after another seven miles SR 229 will meet the Ruby Valley road (designated as SR 767 at that point). Turn left along the base of the Rubies in the direction of Harrison Pass, the Gallagher Fish Hatchery, the Ruby Lake National Wildlife Refuge, Cave Creek, Shantytown, and the Ruby Marshes. The driving distance from Wells to the south end of Ruby Valley is roughly 90 miles. The next opportunity for gasoline along the Ruby Valley road is still another 70 miles or so at Ely. There are no services whatsoever anywhere along the Clover or Ruby Valley roads and ranches along the way are few and far between. Shantytown, although on the map and located just a short distance south of the Ruby Lake National Wildlife Refuge in Ruby Valley, likewise has non-existent services. Continuing further south past Ruby Valley in the direction of Long Valley (towards Ely), the terrain becomes more remote and the road is suddenly a road less traveled. Having trouble along here, the lonely bull by the side of the road would probably be sympathetic but would not be of much help in an emergency. And continuing further south, the road would eventually intersect with US 50, called the Lonliest Road in America, with another 30 miles to Ely. Search This Site With: www.atomz.com to Identify Pages that Contain Subject Matter of Interest. Use of the "Exact Phrase" option is usually recommended in order to avoid most non-relevant hits. Set Within: to 'Anywhere' in order to also include text captions on photos. Hits on the search terms will provide links to the page(s) where the text is located along with text summaries. The summaries should help identify the pages with the desired information. The search engine identifies exact text (or almost exact text) and not concepts. For example, to find photos of North Furlong Lake (or anything else), do not search for 'photos of North Furlong Lake'. Instead, search for 'North Furlong Lake' which will identify pages containing that text and most or all identified pages will usually have the related photos.